A "Tween" Room That's Just Fab-TAB-ulous! Arlene Franklin is an Atlanta-based interior decorator who specializes in helping her clients realize their dream rooms on practical budgets. "I believe that beautiful design is all about ingenuity...and the ability to create extraordinary rooms with "ordinary" budgets is its own sweet reward", she says. 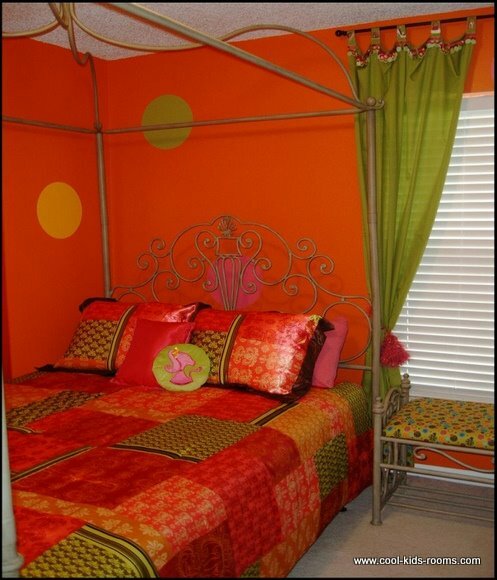 This "tween" room was inspired by the vibrant orange wall color. With a bite-sized budget of $200 for materials in hand, we were off to the design races. The full size comforter set was purchased from Wal-Mart. Its playful large square color combo of orange, hot pink, lemon yellow and lime was the perfect complement for those zesty walls! The girls for whom this room was created love shoes and purses. 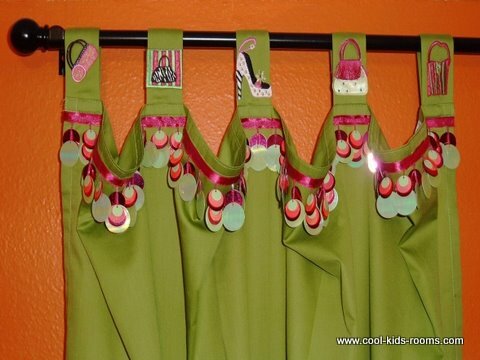 A pair of ordinary lime tab tops (purchased at Lowes Home Improvement) were the perfect backdrop for appliques purchased from Wal-Mart. Each tab received its own iron-on shoe or purse applique, infusing these ordinary tab-tops with the girls' whimsical personality and interests. Utilizing a curtain rod previously purchased by the homeowner, I hung the standard 84" tab tops at ceiling height thus requiring them to be lengthened. 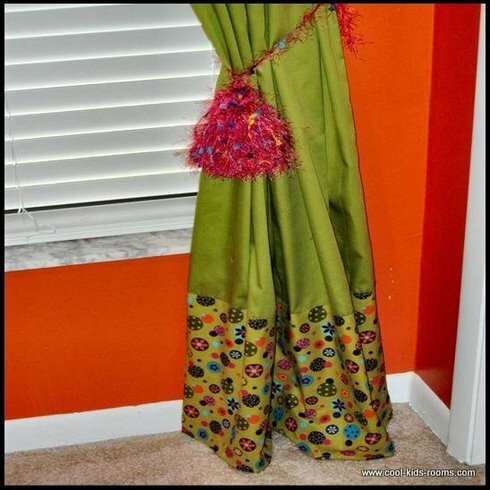 So I chose a coordinating 45" cotton fabric and added it to the bottom of each drape. Finally, I applied flat sequin trim (available at Wal-Mart) with hot glue along the leading edge of each drape for additional detail and interest. With a staple gun and more of the same fabric, I covered the cushion of the bedside bench to tie the look together. The pom-pom curtain tiebacks were made from two skeins of coordinating yarn...too much fun! I left the wrought iron canopy of the bed unadorned, allowing its graceful swirls to lend air and light to the overall design. After reading about the girls and what they like, it seems, who they are was captured in this design. It is personalized with bright, cheerful color and it is a very well put to together design. It's a beautiful room, one I know I could get use to if I were a teen!